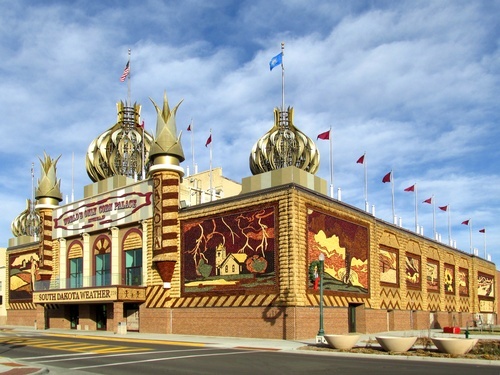 The World’s Only Corn Palace stands as a majestic, uniquely American, folk art icon on the rolling prairies of South Dakota. 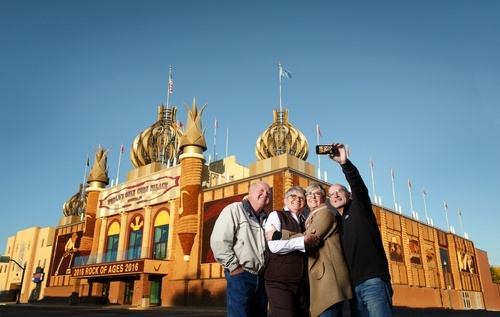 Today the Corn Palace lives on because it has a story to tell, about a state and a people who have prevailed in a land that writes its own rules about who lives here and what grows here. 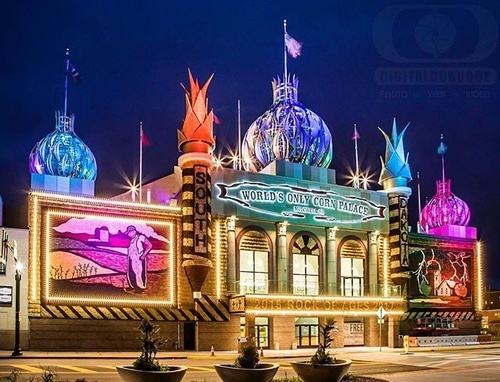 The Corn Palace is decorated annually with 7 murals made out of 12 different colors of corn, each framed with native grasses, straw, milo, and sourdock. A local farmer grows all the corn for the Palace, local artist(s) design the murals, and a team of approximately 20 workers change out the murals every year beginning in late-August and working into September (as crops become available). The Palace is never un-decorated, as the murals are not taken down until it is time to replace them in the late summer, when the work is a gradual process. The honor of designing of the murals has been done by several artists including Oscar Howe, a Yanktonai Sioux Artist who taught school at Dakota Wesleyan University and was Artist Laureate of South Dakota; Cal Schultz, a local artist; and presently, art students Dakota Wesleyan University. The re-designing process actually begins several months before the corn crops are ready in late-August. A committee decides a theme, the artist(s) then plans the designs for each mural, and the images are projected and drawn onto black roofing paper that replaces the previous year’s murals. The designs are marked with a code as to where each different color of corn should go. It's like a giant paint-by-number project!